An exciting new Indian cookbook with a fresh approach to a much-loved cuisine, filled with simple and authentic recipes with an emphasis on regional dishes and Indian street food that can be prepared quickly and without fuss. 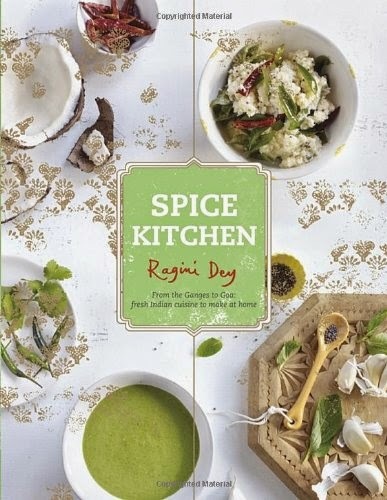 Spice Kitchen is a collection of Ragini’s favorite dishes from her restaurant and the best street food-inspired dishes from her childhood and travels throughout India. Fresh, bright, and beautifully designed, Spice Kitchen moves away from the staid, dark photography and cluttered design of many Indian cookbooks on the market. It is divided into chapters according to ingredients—seafood, poultry, meat, and vegetables with additional sections for starters and accompaniments, side dishes, and desserts. There is also a basics section for spice blends as well as a glossary for the less initiated. Recipes include chickpea masala, twice-cooked fish jalfrezi, classics such as tandoori chicken, rogan josh, and pork vindaloo, and traditional recipes for chutneys, and raitas. Delicious desserts like passion-fruit kulfi are also included. With an emphasis on authentic dishes that are easy to re-create at home, Spice Kitchen is a must-have for lovers of Indian cuisine and those who adore cooking vibrant, colorful, and richly flavored food.